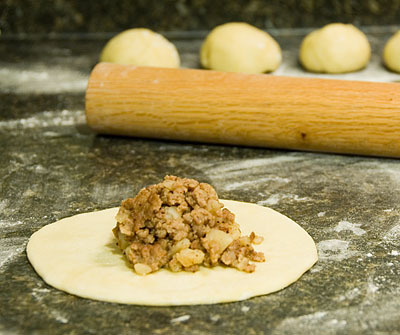 The other day I decided to try turning a Quebecois favorite, the Tourtiere (or pork pie), into a Spanish hand-held treat, an empanada. Growing up, these pork pies were almost always a winter food; more specifically, Christmas food. I’m really not sure why but my dad says that’s just the way it was in his house and that’s pretty much the way it was in ours. Even wikipedia agrees with my dad citing, “It is a traditional Christmas and/or Christmas Eve and New Year’s Eve dish in Quebec”, so he must be right, non? So what is this Quebecois pork pie thing? Usually a tourtiere consists of cooked ground pork and potatoes heavily spiced with cloves, allspice, and sometimes cinnamon all wrapped up in a double-crusted pie. I thought they’d make for a good filling for an empanada so I gave it a try. The filling is a piece of cake to make, brown up some pork, add some spices, stir in the potatoes, and you’re done. 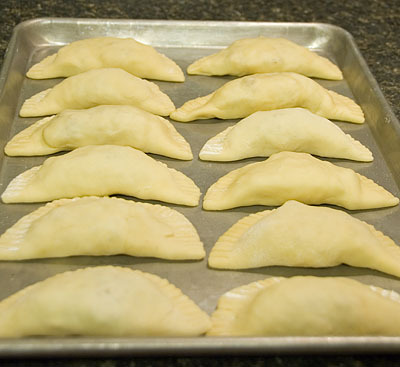 The empanada pastry was a little bit more work, but with the help of a kitchen-aid it wasn’t all that bad. I was expecting something more like a pie dough but once it started coming together it was obvious that it was more like a bread dough. The bread-like dough made over-stuffing the pies all the easier (which is a good idea). The verdict? I think they were a success. I would have preferred more of a pie-like dough, but they still were very good. 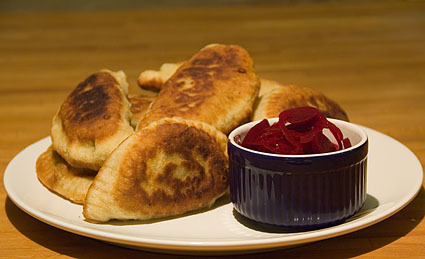 They were a bit more work than just making a few meat pies but they were worth the effort. This tray of pies fed me for dinner and then a few lunches during the week! Place potatoes in a large pot of cold water and cook until fork tender. Drain the water and set aside. Heat the oil in a large frying pan and sautee the pork until lightly browned. Add the spices and potatoes and check seasoning. 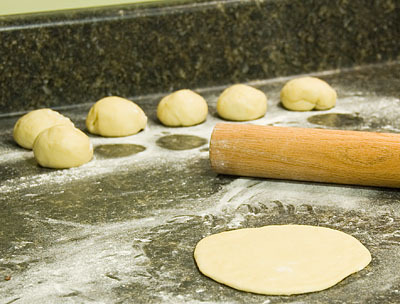 Remove from pan and cool before filling the dough. Combine all the dry ingredients in a large bowl, add all the wet ingredients. Mix for a few minutes until well combined and dough ball forms. Take it out and knead for about 3 minutes. Let the dough rest wrapped in plastic-wrap for 15 minutes. Divide into 12 pieces, then roll into 4 inch circles. Pre-heat the oil in a frying pan at about a medium temperature. Fry for about 5 minutes on each side until golden brown. What a great idea! Looks like they turned out fantastic!